Lady Sew and Sew’s 2016 Row-by-Row, designed by Judy, was inspired by what our Home, Henley on Thames, is so famous for; the Henley Royal Regatta. The rowing season finishes each year with the finals being competed in a Regatta attended by members of the Royal Family. The Henley Royal Regatta attracts visitors and competitors from all over the world. It is a truly magical event. The Henley Regatta, our home town. The race is close. Two boats are being followed by the umpire’s boat. The water is sparkling; lace or organza could be overlaid to give extra embellishment. The man is dressed in a traditional straw boater and blazer. The woman is wearing an expensive frock. There is green grass and trees in the distance. The row is pieced in a deliberately haphazard and random way. This could hide a multitude of sewing sins and will make every row unique to the maker. 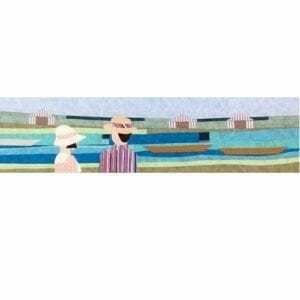 The people are appliqued and optional rowers embroidered on to the panel.